A Day Late and A Dollar Short: SaveMore.com - Boston Market $25 Gift Card for only $15! 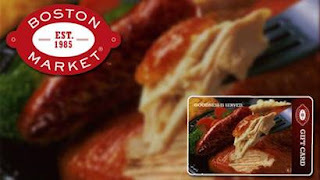 SaveMore.com - Boston Market $25 Gift Card for only $15! While quantities last - limited amount available! SaveMore.com has $25 Boston Market gift cards available for only $15 again. This deal is open to all users! Visit the SaveMore website to buy yours today before they are all gone!